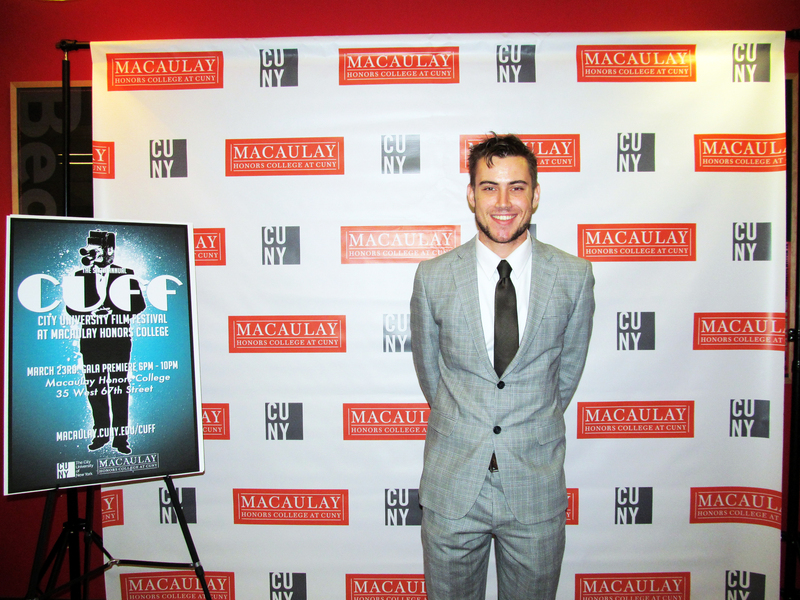 The Sixth Annual CUNY film festival was held at the Macaulay Honors College, 35th West 67th Street, where receptionists donned smiles,exchanged greetings, and ushered attendees into a dining room already filled with students anxious to display a private screening of months of productions. Only a small percent of the approximated seventy submissions received were finalists totaling fourteen films, ranging from four to ten minutes each. Submissions were required to be made exclusively by undergraduates, graduate students, alumni or faculty of CUNY. Films of any genre or length were accepted in that they were made in the past two years. Over fifty attendees engaged in light conversation over a small jazz band between refreshments. With cans of Coke in hand, featured artists described their inspiration behind the films, dissected technique, or posed in front of the camera on the red carpet. Byrnes landed as a finalist in the film festival with five-minute film called Missed about a woman painting over wallpaper fitting for a newborns room telling the story of a couple who experienced the toll of a miscarriage. “Sometimes things get in the way, sometimes you can’t complete them,” surmised Byrnes. Given his submission, it was clear that months of effort had been dedicated towards the delicate details such as lighting, directing, and content. 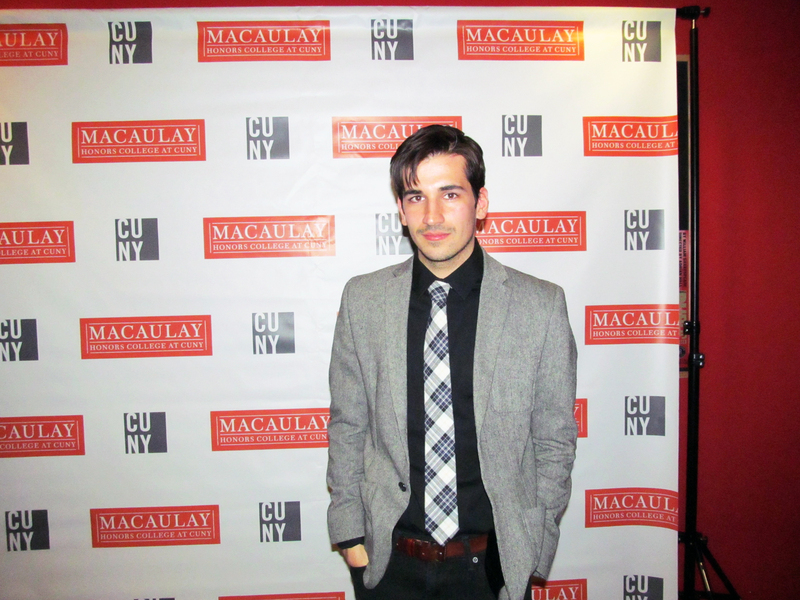 Macaulay Honors College and CSI alumnus, David DiLillo submitted five-minute film entitled Carnival Autumn that focused on memories of his own childhood showing foliage of upstate New York at a local carnival as well as rural areas of York, Pennsylvania. DiLillo’s film introduced a beautiful juxtaposition between music and photography, a rare addition to the other collection of films screened that night. Before the group was ushered upstairs to a private theater for viewing, many stopped for a quick shot by the red carpet and picked up a program. The program handed out by CUFF introduced the finalists, as well as the sponsors, B&H Photo Video Pro Audio and AMC Networks Inc.
As the lights dimmed in the theater and the audience was introduced to the fourteen short films. Screenings that were shown but were out of competition were; The Seagull by Nikolaos Sarafis, Ladies Man by Lee Quinby, Breathwork by Daniel Cowen. Finalists in competition were; A Qui La Faute by Morgan Gicquel, Until Next Time by Matthew Marquez, Cosplay: The Art of Self-Expression by Shelley Hu, Rice by Uladzimir Taukachou, Shanghai Gourmet by Carey Hu, Missed by Tyler Byrnes, Super Wild by Josephus Tutud, and Carnival Autumn by David Delillo. Prize winners in competition were in third place Segues by Kenneth Axen, second place Erased by Alison Corsie, and the grand prizewinner Shoot One, Please was directed by Ken Christensen. Christensen is a recent graduate of the CUNY Graduate School of Journalism, and a multimedia journalist in New York City. The seven minute and seventeen second winning film was featured in the Opinions section of the New York Times. The film followed a fifteen-year-old boy, Glen Cioccari and his father from Stanford, NY during an early morning hunting trip. This Opinion styled documentary focuses on how young teenage children are affected by family pressures and the culture of hunting. The wide-variety of the films exhibited the time and attention dedicated toward detail by each artist. While The Seagull made use of beautiful Greek countryside, Ladies Man donated a calmer documentary centered around the life of a Jazz legend. Each film seemed to meet it’s polar opposite in the hour and a half screening session. A Qui La Faute played up a classy old film look and feel while Cosplay: The Art of Self- Expression made use of the vibrant colors of costumes and makeup. Rice revolved about a village’s backbreaking efforts to plant, harvest, and sell produce but Shanghai Gourmet dissected the lifestyle of American-Chinese cuisine. The multitude of topics, emotions, and colors released from each film truly gave the feeling of a festival. While viewers remained quiet throughout the screening, scenes from each film were occasionally punctuated with laughter, sighs, and gasps. Amidst applause for every film, the evening concluded with Flynn addressing all the participants and viewers with thanks. Each production was lauded for its individualism but Flynn made sure to give respect to the collective effort as well. With that developed sense of victory, finalists, runner-ups, and grand prizewinners exited the stage for dessert, all congratulating each other for their hard work. Despite the competitive nature of CUFF, CUNY students still held the night in celebration of months of preparation, development, and editing.